D’Vauntes Smith-Rivera’s stock was on the rise all spring – but that will be put on hold for up to a month, as the 6-foot-3 rising junior guard suffered a knee injury that will keep him out for July. His doctor said it was a torn meniscus, but is not too bad. “I’m happy about that,” Smith-Rivera said. The stocky Smith-Rivera, who hails from North Central High School (Ind.) and runs with Team Indiana Elite on the AAU circuit, holds offers from Wake Forest, Miami (Fl. 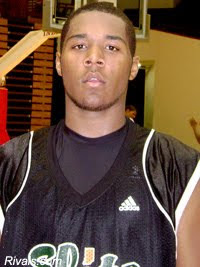 ), Xavier, Florida, Ohio State, Indiana, Cincinnati, Oregon State, Purdue and Tennessee, with interest from Georgetown. His recruitment continues to increase as he gets more attention, but he is not worried about the missed time. “I’ll be even stronger after this,” Smith-Rivera said.